Ancient History Punjab during Mahabharata times was known as Panchanada.Indus Valley Civilization spanned around much of the Punjab region with cities such as Harrapa (modern-day Punjab, Pakistan) and Ropar (modern-day Punjab, India). The arrival of the Indo-Aryans led to the flourishing of the Vedic Civilization along the length of the Indus River to cover most of Northern India. This civilization shaped subsequent cultures in the Indian Subcontinent and Afghanistan. Punjab was part of the great ancient empires including the Gandhara Mahajanapadas, Nandas, Mauryas, Sungas, Kushans, Guptas, Palas, Gurjara-Pratiharas and Hindu Shahis. Agriculture flourished and trading cities (such as Jalandhar and Ludhiana) grew in wealth. Due to its location, the Punjab region came under constant attack and influence from the west. Punjab faced invasions by the Persians, Greeks, Scythians, Turks, and Afghans. This resulted in the Punjab witnessing centuries of bitter bloodshed. Its legacy is a unique culture that combines Zorastrian, Hindu, Buddhist, Persian, Central Asian, Islamic, Afghan, Sikh and British elements. those of Alexander the Great, Chengiz Khan and Tamerlane. Of particular importance were the periods of contact between Punjab and various Persian Empires when the parts of it either became integrated with the empire itself, or was an autonomous region which paid taxes to the Persian King. In later centuries, when Persian was the language of the Mughal government, Persian architecture, poetry, art and music was an integral part of the region's culture. The official language of Punjab remained Persian until the arrival of the British in the mid 19th century, where it was finally abolished and the administrative language was changed over to English. The Mughals controlled the region from 1524 until 1739 and would also lavish the province with building projects such as the Shalimar Gardens and the Badshahi Mosque, both situated in Lahore. Muslim soldiers, traders, architects, theologians and Sufis flocked from the rest of the Muslim world to the Islamic Sultanate in South Asia and some may have settled in the Punjab. Following the decline of the Mughals, the Shah of Iran and founder of the Afsharid dynasty in Persia, Nader Shah crossed the Indus and sacked the province in 1739. Later, the Afghan conqueror Ahmad Shah Durrani, incidentally born in Panjab, in the city of Multan made the Punjab a part of his Durrani Empire lasting until 1762. The religion of Sikhism began at the time of the Conquest of Northern India by Babur. His grandson, Akbar supported religious freedom and after visiting the langar of Guru Amar Das had a favorable impression of Sikhism. As a result of his visit he donated land to the langar and had a positive relationship with the Sikh Gurus until his death in 1605. His successor, Jahangir, saw the Sikhs as a political threat. He arrested Guru Arjun Dev because of Sikh support for Khusrau Mirza and ordered him to be put to death by torture. Guru Arjan Dev's Martyrdom led to the sixth Guru, Guru Har Gobind, declaring Sikh sovereignty in the creation of the Akal Takht and the establishment of a fort to defend Amritsar. Jahangir attempted to assert authority over the Sikhs by jailing Guru Har Gobind at Gwalior and released him after a number of years when he no longer felt threatened. Sikhism did not have any further issues with the Mughal Empire until the death of Jahangir in 1627. His successor, Shah Jahan "took offense" at Guru Har Gobind's sovereignty and after a series of assaults on Amritsar forced the Sikhs to retreat to the Sivalik Hills. Guru Har Gobind's successor, Guru Har Rai maintained the guruship in the Sivalik Hills by defeating local attempts to seize Sikh land and taking a neutral role in the power struggle between Aurangzeb and Dara Shikoh for control of the Timurid dynasty. The ninth Guru, Guru Tegh Bahadur, moved the Sikh community to Anandpur and traveled extensively to visit and preach in Sikh communities in defiance Aurangzeb, who attempted to install Ram Rai to the guruship. He aided Kashmiri Brahmins in avoiding conversion to Islam and was arrested and confronted by Aurangzeb. When offered a choice between conversion or death, he chose to die rather than compromise his principles and was executed. Guru Gobind Singh, assumed the guruship in 1675 and to avoid battles with Sivalik Hill Rajas moved the gurship to Paunta. He built a large fort to protect the city and garrisoned an army to protect it. The growing power of the Sikh community alarmed Sivalik Hill Rajas who attempted to attack the city but the Guru's forces routed them at the Battle of Bhangani. He moved on to Anandpur and established the Khalsa, a collective army of baptized Sikhs, on March 30, 1699. The establishment of the Khalsa united the Sikh community against various Mughal-backed claimants to the guruship. In 1701, a combined army composed of the Sivalik Hill Rajas and the Mughal army under Wazir Khan attacked Anandpur and, following a retreat by the Khalsa, were defeated by the Khalsa at the Battle of Mukstar. In 1707, Guru Gobind Singh accepted an invitation by Bahadur Shah I, Aurangzeb's successor to meet in southern India. When he arrived in Nanded in 1708, he was assassinated by agents of Wazir Khan, the governor of Sirhind. Banda Singh Bahadur was an ascetic who converted to Sikhism after meeting Guru Gobind Singh at Nanded. A short time before his death, Guru Gobind Singh ordered him to reconquer Punjab and gave him a letter that commanded all Sikhs to join him. After two years of gaining supporters, Banda Singh Bahadur initiated an agrarian uprising by breaking up the large estates of Zamindar families and distributing the land to the poor Sikh, Hindu,and Muslim peasants who farmed the land. Banda Singh Bahadur started his rebellion with the defeat of Mughal armies at Samana and Sadhaura and the rebellion culminated in the defeat of Sirhind. 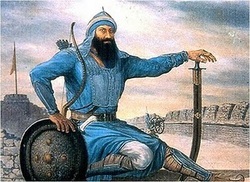 During the rebellion, Banda Singh Bahadur made a point of destroying the cities in which Mughals had been cruel to Sikhs, including executing Wazir Khan in revenge for the deaths of Guru Gobind Singh's sons, Baba Zorawar Singh and baba Fateh Singh after the Sikh victory at Sirhind. He ruled the territory between the Sutlej river and the Yamuna river established a capital in the Himalayas at Lohgarh and struck coinage in the names of Guru Nanak and Guru Gobind Singh. In 1716, his army was defeated by the Mughals after he attempted to defend his fort at Gurdas Nangal. He was captured along with 700 of his men and sent to Delhi where he was tortured and executed after refusing to convert to Islam. The period from 1716 to 1799 was a highly turbulent time politically and militarily in the Punjab. Ahluwalia Led by Sardar Jassa singh ahluwalia , area of Jullundar Doab and army of 10,000 regular horsemen. Their held territory in the neighborhood of Kapurthala, in the Jalandhar doab, and some villages in Majha such as Sarhali, Jandiala, Bundala, Vairowal and Fatehabad. Dalewalia Led by Gulab singh Dalewalia. Later under their leader Tara Singh Ghaiba they held Rahon, Mahatpur, Nawanshaher and Phillaur. Approximately 5000 regular horsemen. They were always ahead of others. Dalewalias were continuously moving and helping other Misls on the command of supreme commanders Nawab Kapur Singh and later Sardar Jassa Singh Ahluwalia. Faizalpuria. Led by Nawab Kapur singh virk . Approximately 5,000 horsemen. The territories held were Jalandhar, and the villages of Banur, Ghanauli, Manauli and Bharatgarh, in the Malwa. Kanaihya. 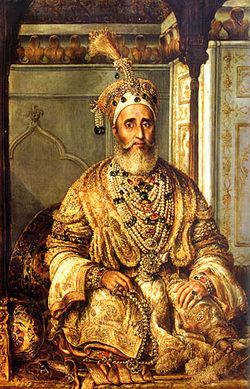 Led by Jai singh Kanaihya. This regiment ruled the area of riarki around Batala approximately 8,000 horsemen. Karor singhia. Karora singh Dhaliwal established this Misl, Their territory was Hoshiarpur and its surrounding areas. His successor Baghel singh Dhaliwal subdued the force less Mughal Emperor Shah Alam I of Delhi, and located and constructed the Gurudwaras in Delhi, in the memory of Seventh Guru, Ninth Guru and others. A special note is made here by a late historian Hari Ram Gupta that contrary to what happened in raids by other powers which were frequent in those uncertain times, during those attacks by Sikhs there was not a single instance of woman having been molested. Later when Shah Alam gave him 2 Lakh tribute Baghel Singh vacated Delhi on the condition that his 30,000 forces will stay in Delhi, Where his forces stayed, it is still known as Tees Hazari in Delhi. Approximately 10,000 horsemen, many other irregular forces. Their forces combined with Ahluwalia misl crossed Jamuna and captured Saharanpur in Feb 20, 1764. The Sikhs overran the territory of Najib-ud-daulah the Rohilla Chief, and returned after realizing from him a tribute of eleven lakhs of rupees. Nakai Led by Hari singh Nakai. This band ruled the area between Ravi and Ghara, Naka Area. Approximately 7,000 horsemen. They ruled over the country South of Lahore, between Ravi and the Sutlej. Nishanwala Led by Dasaundha singh. So called Nishanwala cause they carry the Nishan Sahib, the Sikh flag in the battle. Approximately 2,000 horsemen. Their territory was Ambala, Ropar, Anandpur Sahib, several hill chiefs paid tribute to this misl. Ramgarhia Led by Nand singh Sanghania, so called as they extended fort of Ram Rauni at Amritsar which was later called Ramgarh. Riarki Area around Batala Approximately 5,000 horsemen. Their territory was parts of Amritsar, Qadian, Batala and Sri Hargobindpur, in the Bari doab and Miani, Sarih, and Urmur Tanda in the Jalandhar Doab. Jassa Singh Ramgarhia was a great Sikh warrior of times of Nawab Kapur Singh and Jassa Singh Ahluwalia. He led Khalsa army in many battles. In command of Dal Khalsa he was just behind Jassa Singh Ahluwalia after the retirement of Nawab Kapur Singh. Phulkian. Misl is the only misl that was kicked out of the Dal Khalsa due to its anti Sikh policies in the time of Baba Deep Singh and Nawab Kapur Singh. This misl was founded by Baba Ala Singh. Click here to read more about Phulkian Misl What impelled these Sikh confedracies to united and zealous action was their faith in the common destiny of the Khalsa. Any call for a joint cause was joyfully answered and the greatest sacrifices willingly made for its realization. Their living conviction was that the Guru had invested them with moral and temporal dignity and charged them with the duty of liberating the country imparted an element of philanthropy to their extremely dangerous and heroic adventure. 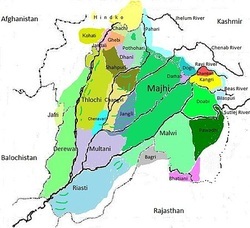 The jewel in the crown of the empire was that of Punjab or land of the five rivers, the Beas, Ravi Sutlej, Chenab and Jhelum, which are all tributaries of the Indus river. The Empire was subject to the governance of the Sarbat Khalsa, a biannual gathering of the Khalsa Panth in Amritsar. During the time before Maharaja Ranjit Singh's sucession to ruler the areas was attacked frequently by Ahmed Shah Abdali and Nadir Shah but the Sikhs were a strong collaboration and would grow stronger and stronger in defence of such attacks, the time is remembered as a heroic century. Despite only being a tiny proportion of the area's population the Sikhs rose to power against unseemable odds, the religious demographics of the Sikh Empire show that 80% was Muslim, with 10% Hindu and 10% Sikh. The army of the empire was called the Dal Khalsa until Maharaja Ranjit Singh came to power and it was renamed the Sikh Khalsa Army. The Sikh Khalsa Army was responsible for land warfare, land defence, and all responsibilities for the protection of the Sikh Empire's political institutions and national security. The army was responsible and answerable to Maharaja Ranjit Singh with very strong commitments to the Guru of the Sikhs the Guru Granth Sahib. At the time the army was viewed as the premier fighting force of all of Asia. From 1819 to 1838 the army grew from a total of 12, 909 to over 87, 000, this included 35,000 regular fully professional soldiers qualified with the latest military training of the time and a back up of 52,000 irregular forces. If needs be there was a large reservoir of feudal and militia forces numbering approximately 250,000. The Commander-In-Chief of Maharaja Ranjit Singh's army was Hari Singh Nalwa (1791-1837), he was one of the most honoured Sikh warriors and called "the Murat of the Khalsa" by Sir Henry Griffin. One British newspaper asserted in the early twentieth century that had Nalwa had the resources and artillery of the British, he could have conquoured the East and exteneded the boundaries of the Sikh Empire into Europe. Hari Singh Nalwa was instrumental in the conquests of, Sialkot (1807), Multan (1818), Kashmir (1819), Pakhli & Damtaur (1821-2), Peshawar (1834) and finally Jamrud (1837) in the Khyber Hills. He also served as the goveror of both Kashmir and Peshawar. He had gained the name Nalwa after he had killed a tiger without the aid of firearms. Hari Singh Nalwa was also victorious on his death when he was killed during the battle of Jamrud in 1837, where had he not fighted the Sikh Empire would have lost the entire North West Province, howver Nalwa rose to the challenege of the Afghans and the Sikhs held onto the fort of Jamrud. Hari Singh had met with British, French and German travellers, once such traveller, Baron Charles Von Heigel remembers him fondly in his memoirs. Charles met Hari Singh Nalwa at his residence in Gujranwala and the German was gifted a portrait of Nalwa in the act of killing a tiger after the Baron had told Hari Singh he was already aware of his brave act. Hari Singh Nalwa could write and read Persian, Gurmukhi and Pashto, the language of the Pashtuns. He was also familiar with world politics, including details about European states from his meetings with travelers. Ventura and Allard came in 1822 to seek service in the Sikh army, both of them had served under Napolean Bonepart in the imperial army of France. However after Napolean's defeat at Waterloo they lost their occupation and left Europe to try their fortune in the East. They had heard many a tale of the grandeuf of Ranjit Singh's court and were excited with the idea of visiting Lahore. Maharaja Ranjit Singh, although not educated was very wise and intelligent, he was aware of the exploits of Napolean. Punjabi historians had compared the two rulers and Ranjit singh was even called Napolean of the East. Ranjit singh met these two Europeans and he received them kindly asked them about their health and journey, previous employment, future plans. He showed them his troops on parade and provided amenities for their entertainment. In April of 1822, they sent a letter to Maharaja asking for an employment with his troops. The communication between these soldiers and Maharaja was in French through the trusted aide Faqir Nur-ud-din, who knew French, English, persian as many other languages. The Maharaja wanted to make sure that these people did not have contacts with the British and only when he was one hundered per cent sure, he gave them command of 500 horsemen each. This command had few Purbias (Bihari) and other Hindus of the Central provinces, employed with Ranjit Singh. They were also instructed to train all forces of Sikhs in the western method of drill. Ventura's army was called Fauj-e-Khas while little bit later Allard was asked to raise a cavalry of fresh recruits. Then Ranjit Singh also made them sign an agreement that in the event of a clash between Maharaja and European power, they would remain loyal to Sarkar Khalsa and fight for him. They were to wear their beards long and abstain from beef and tobacco. Ranjit Singh provided houses for Ventura and Allard and gave them handsome salaries. To Ventura he gave 40,000 rupees when he married a Muslim girl from Ludhiana. Two villages were subsequently given to the daughter of Ventura as jagir. Ventura built a house, which still exists near Anarkali, it is a beautiful Cheateau in French style. This shows that even though Ranjit Singh was cautious but shrewd and able enough to distinguish between people beneficial to him. He also emplyed several more European surgeons, such as Dr. Honigberger of Hungary and Dr Benet a Frenchman who was surgeon-general of the Khalsa army. Ranjit Singh was a benevolent king. Whilst the Government of Punjab was called the Sarkar Khalsa, no laws were imposed on any of the minority or majority. He governed the fourty years of his rule from with secular ideals, he would fast with Mulsims during Ramadan and play Holi with Hindus, yet he would be at Amritsar almost every Month to take bath. Once a poor muslim from Lahore had written a Quran which he was going to take to Delhi to sell at the Mughals court. Ranjit Singh asked him how much he wanted and paid him twice as much. One year due to a massive famine, people were starving, so being king, he opened up all the state stores for people. Ranjit singh would often roam in the streets of Lahore in disguise to check his rule, whether people were happy or not. One night he saw an old woman who could not carry a bag of wheat to her house where her children were starving. He carried that bag to her house on his back. Ranjit Singh's death on June 27, 1839, left a deep hiatus. The Khalsa lost a leader who had, by commanding personality, foresight and skill, had secured them the status of sovereign people. The British had by then taken practically the whole of India, except the Punjab and sind. However it would take a further 10 years after the death of this great leader, before the British could gain control. He was succeeded by his eldest son, Kharak Singh (1801-1840), who had gained power in June 1839 after his father's death, but he was removed shortly after on the 8th October 1939 and replaced by his son Nau Nihal Singh. He is thought to have died on the 5th November 1840 from a slow posioning. Nau Nihal's rule was even shorter, he was unable to keep control of the various factions in the kingdom, and upon returning from his father's funeral he was injured when a building collapsed on him. He was taken to a tent away from courtiers, who were prevented from seeing him. Eyewitnesses to the accident had described the initial injuries as small blows to the head that had knocked him unconcious, but later when the tent was opened he was found dead, his head having been smashed in, possibly with a rock. It is argued that the culprits were the Dogra brothers, Gulab Singh and Dhian Singh of Jammu and Kashmir, but this is not universally suported as Gulab Singh's was himself injured in the sam accident and his son was also killed in the same accident. Nau Nihal Singh was then succeeded by Sher Singh (Born: December 1807 - Died: September 16th 1843), who was the son of Ranjit Singh, he became Maharaja after the sudden death of Nau Nihal in 1841. His remembered by historians as being not very smart politically, letting the Dogras take charge of all state functions. In 1843, Sher Singh was killed as he reached for a new shotgun held by Ajit Singh Sandhawalia his cousin, who had pulled the trigger. Sher Singh only had time to utter, "what treachery." The Sandhawalias also murdered Wazir Dhian Singh Dogra. The Sandhawalias were thought to have also had designs on the kingdom. Sher Singh was then succeeded by Duleep Singh (1838 - 1893), the youngest son of Maharaja Ranjit Singh who was the last ruler of the Sikh Empire, ruling from 1843 - 1849. After the close of the Second Anglo-Sikh War, the Punjab was annexed on 29th March 1849, he was dethroned at the age of 11 by the East India Company and was separated from his mother who was imprisoned. In 1853, under the tutelage of his long-time retainer Bhajan Lal (himself a Christian convert) he converted to Christianity at Fatehgarh with the approval of the Governor-General Lord Dalhousie. His conversion remains controversial, having been effected in unclear circumstances before he turned 15. He was also heavily and continuously exposed to Christian texts under the tutelage of the devout John Login. His two closest childhood friends were both English, one being the child of Anglican missionaries. In 1854, he was sent into exile in Britain. Whilst in exile in England Duleep sought to learn more about Sikhism and was eager to return to India. Though previous efforts were thwarted by his handlers, he reestablished contact with his cousin Sardar Thakar Singh Sandhawalia, who on 28 September 1884, left Amritsar for England along with by his sons Narinder Singh and Gurdit Singh and a Sikh granthi (priest), Partab Singh He also brought a list of properties held by Duleep Singh in India, all this renewed his connection with Sikhism. The British Government decided in 1886 against his return to India or his re-embracing Sikhism. Despite protests from the India Office, he set sail for 'home' on 30 March 1886. However, he was intercepted and arrested in Aden, where the writ of the Raj began. He could not be stopped from an informal re-conversion ceremony in Aden, far less grand and symbolic than it would have been in India, done by emissaries sent by Sardar Thakar Singh Sandhawalia, who was earlier planning the Pahaul ceremony at Bombay. Duleep was forced to return to Europe. Duleep Singh died in Paris in 1893 at the age of 55, not having seen India (let alone the Punjab) again after he was 15, except for two brief, tightly-controlled visits in 1860 (to bring his mother to England) and in 1863 (to scatter his mother's ashes). A life-size bronze statue of the Maharajah showing him on a horse was unveiled by HRH the Prince of Wales in 1999 at Butten Island in Thetford, a town which benefited from his and that of his sons' generosity. The Maharaja's death in the summer of 1839 brought political chaos and the subsequent battles of succession and the bloody infighting between the factions at court weakened the state. Relationships with neighbouring British territories then broke down, starting the First Anglo-Sikh War; this led to a British official being resident in Lahore and the annexation of territory south of the Satluj to British India. Sikhs were the first people of the Punjab to rule their own land since Prithviraj Chauhan's defeat. As a condition of the peace treaty, some British troops, along with a resident political agent and other officials, were left in the Punjab to oversee the regency of Maharaja Dhalip Singh, a minor. The Sikh army was reduced greatly in size. In 1848, out-of-work Sikh troops in Multan revolted, and a British official was killed. Within a few months, the unrest had spread throughout the Punjab, and British troops once again invaded. The British prevailed in the Second Anglo-Sikh War, and under the Treaty of Lahore in 1849, the Punjab was annexed by the British East India Company, and Dhalip Singh was pensioned off. The Punjab became a province of British India, although a number of small states, most notably Patiala, retained local rulers who recognized British sovereignty. In every way, the Punjab was one of Great Britain's most important assets in colonial India. Its political and geographic predominance gave Britain a base from which to project its power over more than 500 princely states that made up India. Lahore was a center of learning and culture under British rule, and Rawalpindi became an important Army installation. The Jallianwala Bagh Massacre of 1919 occurred in Amritsar. In 1930, the Indian National Congress proclaimed independence from Lahore. The 1940 Lahore Resolution of the Muslim League to work for Pakistan, made Punjab the centerstage of a different, bloodier and dirtier struggle. In 1946, massive communal tensions and violence erupted between the majority Muslims of Punjab, and the Hindu and Sikh minorities. The Muslim League attacked the government of Unionist Punjabi Muslims, Sikh Akalis and the Congress, and led to its downfall. Unwilling to be cowed down, Sikhs and Hindus counter-attacked and the resulting bloodshed left the province in great disorder. Both Congress and League leaders agreed to partition Punjab upon religious lines, a precursor to the wider partition of the country. The British Punjab province, which includes present-day Punjab province of Pakistan, and the Indian states of Punjab, Haryana, Himachal pradesh was partitioned in 1947 prior to the independence of Pakistan and subsequently, India. 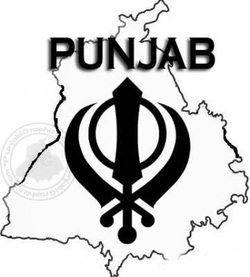 Punjab (pronounced /pənˈdʒɑːb/ ( listen); Punjabi: ਪੰਜਾਬ (Gurmukhi) is a state in the northwest of the Republic of India, forming part of the larger Punjab region. The state is bordered by the Indian states of Himachal Pradesh and Chandigarh to the east, Haryana to the south and southeast and Rajasthan to the southwest as well as the Pakistani province of Punjab to the west, it is also bounded to the north by Jammu and Kashmir. The state capital is Chandigarh, which is administered separately as a Union Territory because it is also the capital of Haryana. Major cities of Punjab includes Mohali, Ludhiana, Amritsar, Bathinda, Barnala, Patiala and Jalandhar. After the partition of India in 1947, the Punjab province of British India was divided between India and Pakistan. The Indian Punjab was divided in 1966 with the formation of the new states of Haryana and Himachal Pradesh as well as the current state of Punjab. Punjab is the only state in India with a majority Sikh population. Agriculture is the largest industry in Punjab, it is the largest single provider of wheat to India. Other major industries include the manufacturing of scientific instruments, water meter, electrical goods, financial services, machine tools, textiles, sewing machines, sports goods, starch, tourism, fertilizers, bicycles, garments, and the processing of pine oil and sugar. Punjab also has the largest number of Steel Rolling Mill Plants in India which are located in Steel Town Mandi Gobindgarh, District Fatehgarh Sahib. The word Punjab is a combination of the Indo-Iranian words Punj (five) and āb (water), and thus the (land of) five rivers. The five rivers are the Beas, Sutlej, Ravi River, Chenab River and Jhelum River. Sometimes, in English, there can be a definite article before the name i.e. the Doaba. The name is also sometimes spelled as Duoab or Douaab or Doaab. Most of the Punjab lies in a fertile plain, alluvial plain with many rivers and an extensive irrigation canal system. A belt of undulating hills extends along the northeastern part of the state at the foot of the Himalayas. Its average elevation is 300 meters above sea level, with a range from 180 meters in the southwest to more than 500 meters around the northeast border. The southwest of the state is semi-arid, eventually merging into the Thar Desert. 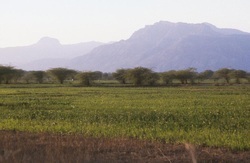 The Siwalik Hills extends along the northeastern part of the state at the foot of the Himalayas. Punjab's climate is characterized by extreme hot and extreme cold conditions. Annual temperatures in Punjab range from –2 to 40 °C (min/max), but can reach 47 °C (117 °F) in summer and –4 °C in winter. 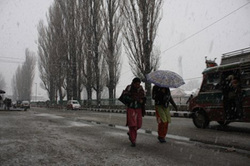 The northeast area lying near the foothills of the Himalayas receives heavy rainfall, whereas the area lying further south and west receives less rainfall and experiences higher temperatures. Average annual rainfall ranges between 960 mm in the sub-mountain region and 460 mm in the plains. 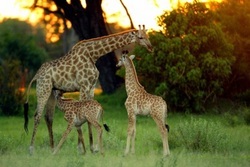 There are a number of wetlands, bird sanctuaries and zoological parks across Punjab. These include the Hari-Ke-Pattan National Wetland and Wildlife Sanctuary at Harike in Firozepur District, the Kanjli Wetland, the Kapurthala Sutlej Water Body Wetland, the Ropar Zoological Park, Chhatbir, Bansar Garden, Sangrur, the Aam Khas Bagh, Sirhind, the Ram Bagh Garden Amritsar, the Shalimar Garden, Kapurthala and the Baradari Garden at Patiala. The state bird of Punjab is the Baz (Eastern Goshawk) (Melierax poliopterus), the state animal is the Blackbuck (Antilope cervicapra), and the state tree is the Shisham . In 1947 the Punjab province of British India was divided along religious lines into West Punjab and East Punjab. The western Punjab was assimilated into new country of Pakistan while the east Punjab stayed in India. This led to massive rioting as both sides committed atrocities against fleeing refugees. The Partition of India in 1947 split the former Raj province of Punjab; the mostly Muslim western part became the Pakistani province of West Punjab and the mostly Sikh and Hindu eastern part became the Indian province of Punjab. Many Sikhs and Hindus lived in the west, and many Muslims lived in the east, and so partition saw many people displaced and much intercommunal violence. Several small Punjabi princely states, including Patiala, also became part of India. The undivided Punjab, of which Punjab (Pakistan) forms a major region today, was home to a large minority population of Punjabi Sikhs and Hindus unto 1947 apart from the Muslim majority. At the time of independence in 1947 and due to the ensuing horrendous exchange of populations, the Punjabi Sikhs and Hindus migrated to India. Punjabi Muslims were uprooted similarly from their homes in East Punjab which now forms part of India. Approximately 7 million plus who moved to Pakistan, over 6 million settled in Punjab. In 1950, two new states were created; the former Raj province became the state of Punjab, while the princely states were combined into the Patiala and East Punjab States Union (PEPSU). Himachal Pradesh was created as a union territory from several princely states and Kangra district. In 1956, PEPSU was merged into Punjab state, and several northern districts of Punjab in the Himalayas were transferred to Himachal Pradesh. Formation of current Punjab The capital of the undivided Province of Punjab, Lahore, ended up in Pakistan after partition, so a new capital for Indian Punjab was built at Chandigarh. After years of struggle by the Akali leadership(Punjabi Suba Movement) and detention of thousands of Sikhs and loss of many lives Punjab was divided on a linguistic basis. On 1 November 1966, the majority Hindi-speaking southern half of Punjab became a separate state, Haryana. Chandigarh was on the border between the two states, and became a separate union territory but serves as the capital of both Punjab and Haryana. During the 1970s, the Green Revolution brought increased economic prosperity for the Punjab, mainly due to the late Pratap Singh Kairon. However, a growing polarisation between the Indian National Congress led central government and the main Sikh political party, the Shiromani Akali Dal, began to widen during the 1970s. Hostility and bitterness arose from what was widely seen by the Akali Dal as increasing alienation, centralization and discriminatory attitudes towards Punjab by the Government of India. This prompted the Shiromani Akali Dal to pass the Anandpur Sahib Resolution which asked for granting maximum autonomy to the region of Punjab and other states and limited role and powers of the Central Government.